One of my dream homes design later is a home that has a living room is elegant and comfortable so as to make all family members and guests who are in it to feel happy and at ease when in the house. Like the living room attractive design of architect Gayuh below. The living room is not too narrow and not too wide it looked so charming and elegant, a combination of interior and furniture in the living room is perfect and able to create a very conducive atmosphere. The Color choices seem alive and vibrant when added together. 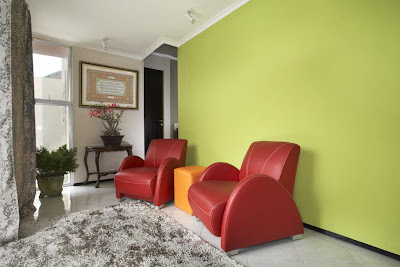 Living room area with a minimum space, but still comfortable in it by combining the color of the walls and furniture so that a proper balance between bright colors and basic colors. Yes, a home like this is what I dreamed when I was married and have families later.